In 1876, Otto Bernz founded the Otto Bernz Co. in Newark, N.J. to sell plumbers’ tools, furnaces, and torches. The company was renamed BernzOmatic in 1940, and has since been recognized as a highly respected global brand, focusing on manufacturing and marketing best-in-class hand held torches and accessories for professionals and consumers. BernzOmatic, part of Newell Rubbermaid’s global portfolio of brands, is committed to developing and manufacturing consumer driven product innovations for the professional torch user. 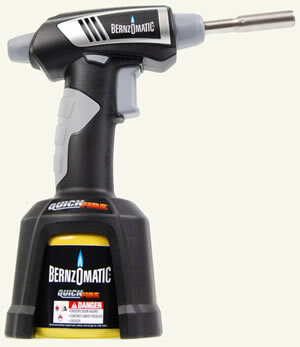 BernzOmatic is a worldwide marketer and manufacturer of a full name brand, hand held torches and accessories. 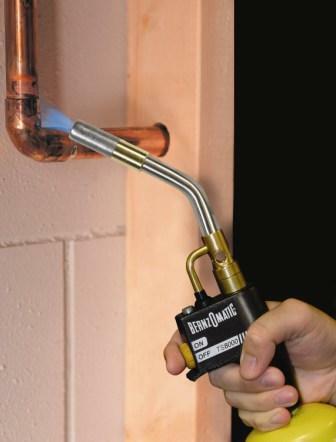 BernzOmatic®, a leading global manufacturer of hand-held torches and accessories, is introducing QUICKFIRE®, a new high-performance torch that is a must-have in every professional’s and serious DIYer’s toolbox. The new QUICKFIRE torch is not only clearly different in its appearance, but it also offers benefits that outdistance every other torch in the handheld torch category. Compact profile — the visual appearance of the new QUICKFIRE Torch is striking, bringing to mind the look of a cordless drill more than a traditional torch. With a 40 percent height reduction, QUICKFIRE’s design adds maneuverability and control in tight spaces for multiple applications. 30 percent faster soldering time — featuring a high-intensity swirl flame, QUICKFIRE provides a hotter, more efficient flame for 30 percent faster soldering time (Than leading BernzOmatic TS4000). This high-performance torch also has an adjustable flame control for accuracy and precision, delivering the highest heat output in its category. QUICK-START — QUICKFIRE’s instant on/off trigger equates efficiency and ease, and its, speedier performance on the jobsite translates into more productivity . . . and more revenue for the trade professional. QUICK-CONNECT Cylinder — compact and efficient, the QUICK-CONNECT cylinder is ready to go with only a quarter turn. One cylinder provides enough fuel to solder 200 fittings—enough to plumb an entire house. QUICK-CONNECT uses Max Power Propylene fuel, which is 20 percent hotter — and faster — than propane fuel. "For decades BernzOmatic has been recognized as the leading innovator in torch development and, with the introduction of the QUICKFIRE torch, we have taken torch design to a new standard of excellence," said Jon Schlosser, Director of Product Marketing for Bernzomatic. "This new innovative design will amaze torch users with its advanced functionality and incredible versatility. Our R&D and exhaustive field trials with the QUICKFIRE have triggered phenomenal responses. From pro-quality water heater installs to home projects, end-users’ response has been overwhelmingly enthusiastic." The new BernzOmatic® TS8000 Trigger Start High Intensity Torch Kit is the latest innovation from the experts in fire and heat technology. This torch completes jobs faster than any other torch that BernzOmatic manufactures because of its high intensity flame. 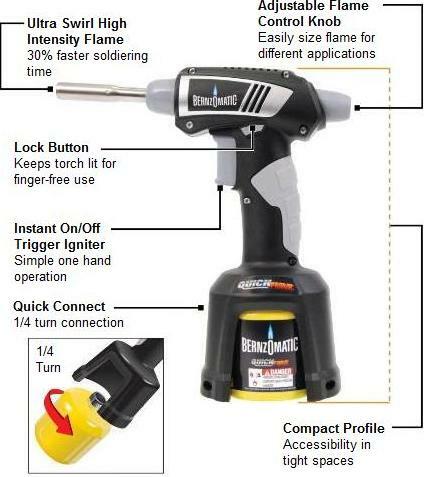 It delivers more heat to the work surface to solder 30% faster than any of BernzOmatic’s other professional grade hand torches. And if used with MAPP gas, it works 33% faster than when using propane. The TS8000 can easily solder copper pipe, loosen rusted bolts and thaw frozen pipes.